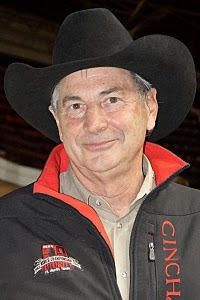 Cowboy Ron! 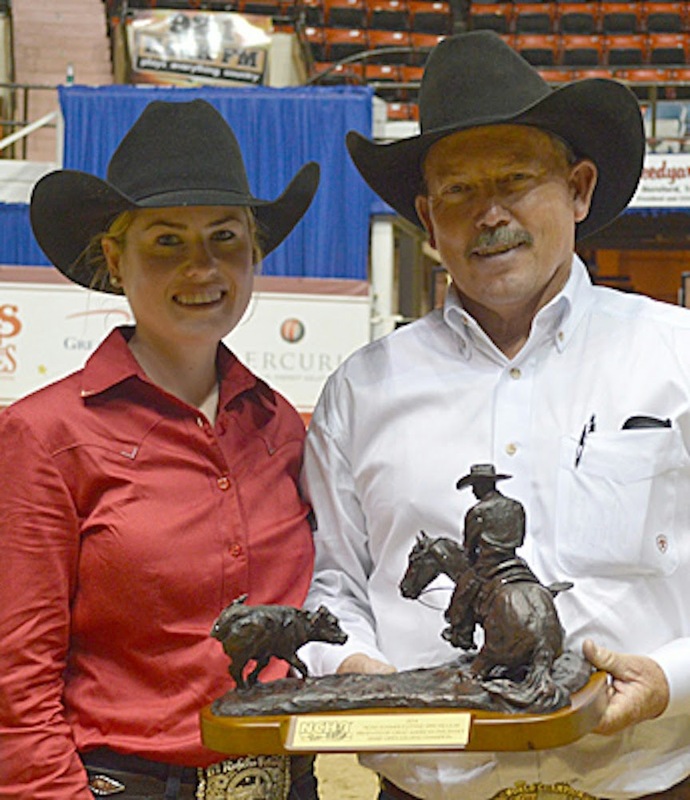 We wish you were there to celebrate with us and see your horse in action! Congratulations on your horse's big win! Scott started his meal with the famous III Forks Salad complete with field greens, blue cheese, granny smith apples and pecans. 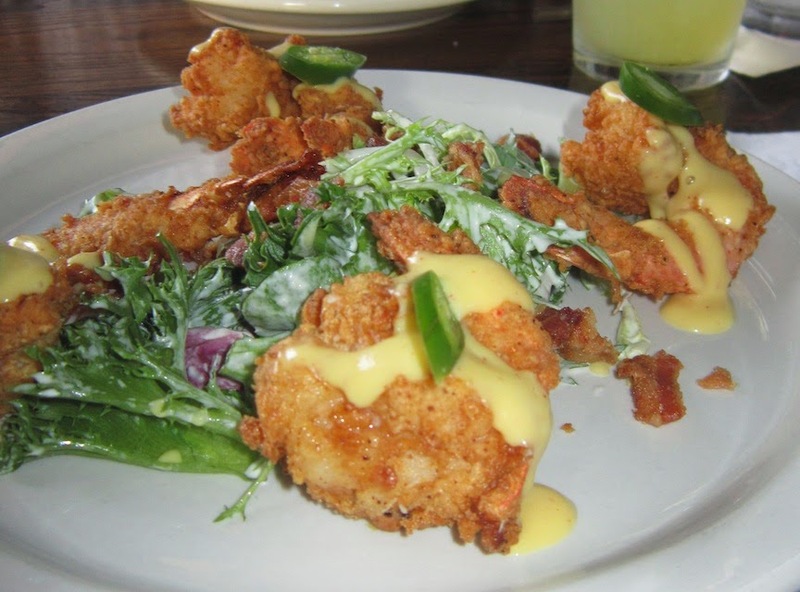 I am not sure why it is called the III Fork Salad but all I can imagine is maybe when one person at a table orders it three fork's of other diners try to go in and enjoy it as well. I had a tough decision on how I wanted to start my meal I was thrown Lobster bisque, Scallops and a Crab Cake into the list of options and I was just so torn. Ultimately, I went for the Crab Cake. The Crab Cake always wins. It was a large portion, enough for two people to share or just one really hungry loper. Mid way through our dining experience Scott was brought over a chest to pick his option of knife to use for his upcoming steak. I though it was so clever. 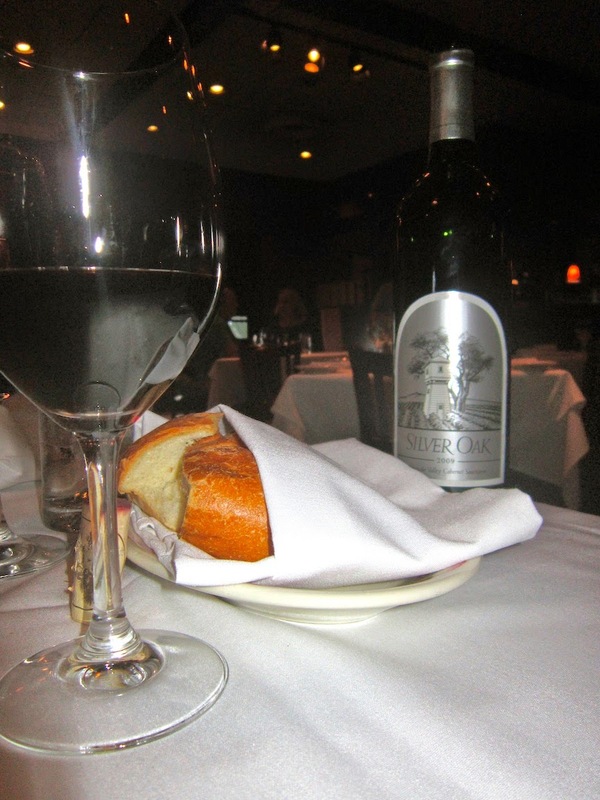 It is the little things that make a dining experience memorable and this is one of them. This bright, cheery plate was of course mine! I went for the Chilean Sea Bass because I a seafood eating machine. The fish was cooked perfectly and was a real whopper in size. The one thing I missed on my plate was mashed potatoes, I think wild rice is fine but I just love, love the mashed potato of heaven. Green snap peas, slices of tomato and creamed corn made me feel like I met my vegetable quota for the day so I left feeling quite healthy. 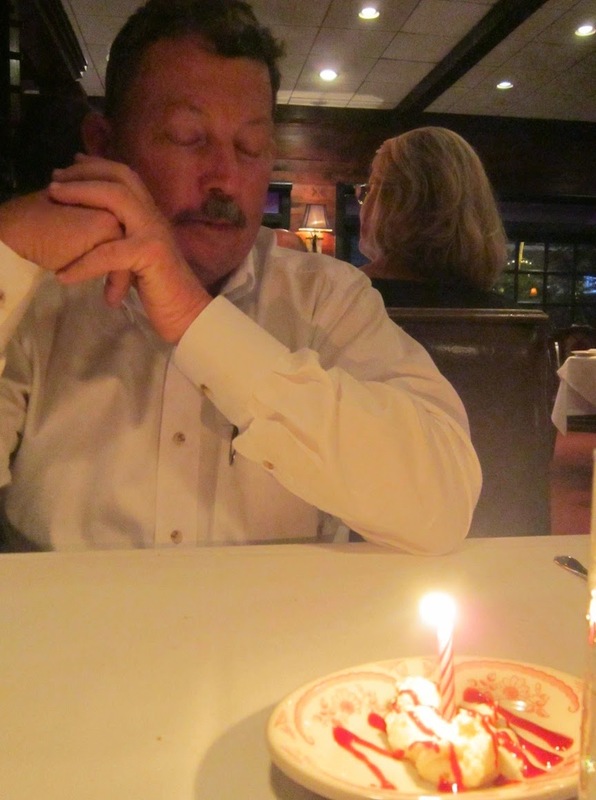 The birthday boy ordered a filet was pleased with his order of medium rare. He was lucky enough to receive the prized potatoes as well as his favorite creamed corn. We also ordered asparagus on the side but I didn't grab a photo of it. 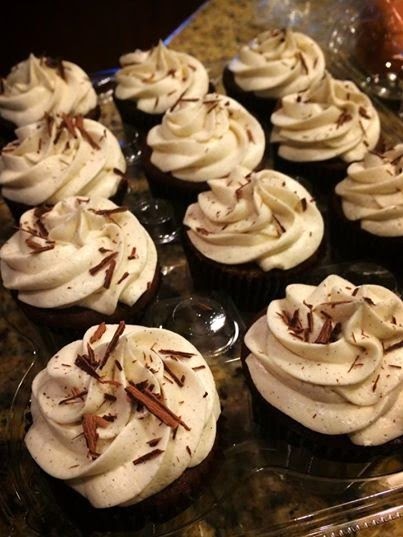 We came home to enjoy a cupcake made by my friend, Mica Chartier. She is extremely talented so I hit her up to make an order for Scott Good Taste. When we got back to the hotel last night we both enjoyed one and called it a day! What a really great experience. One morning Scott explored the Latin side of the menu and ordered the Huevos Rancheros... A crispy tostada shell rested as a base for over easy eggs, salsa and cheese. Refried beans served along side were smooth and totally creamy. We like our bacon crispy and this version was on the verge of almost burnt. I liked it, Scott didn't. I love a good Chicken Fried Steak and this place does it right! The breading on the steak was super crunchy and the gravy whisked up from scratch. I can just tell. The hash browns were nice, I prefer them maybe cooked a little longer and I mostly ignored my egg. I was too full! 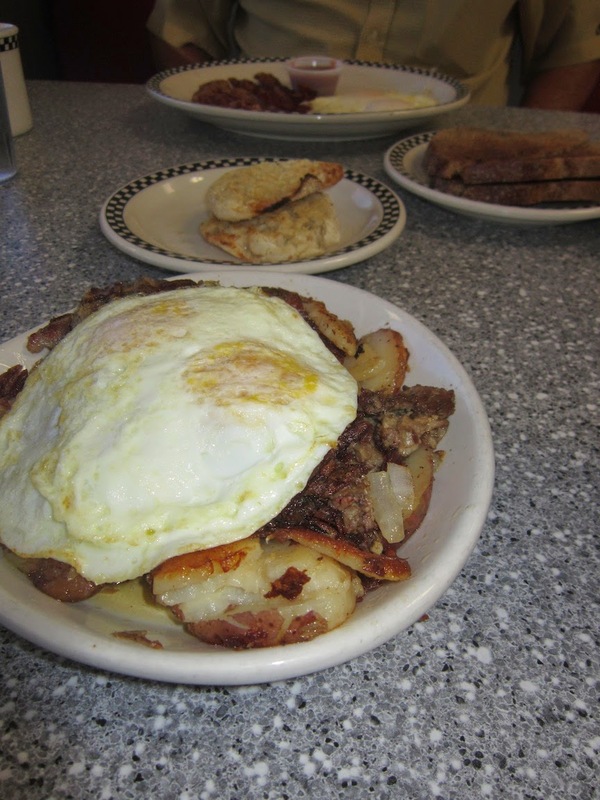 On another separate visit I wanted to try the Corned Beef Hash as I have never tried it before. As I child I had a bad experience with corned beef so it has made me gun shy in my adult years but that morning I decided to give it a go. It was good, maybe a little fatty and salty. I ate most of it but worked my way around the potatoes that were not cooked until golden brown. I ate the yolk of the eggs because they are the most delicious, the whites are just not my thing. Breakfast. My least favorite meal of the day. I guess it is good to explore all types of foods but I would rather just eat an enchilada for breakfast. Or Funyuns. Hey foodies! 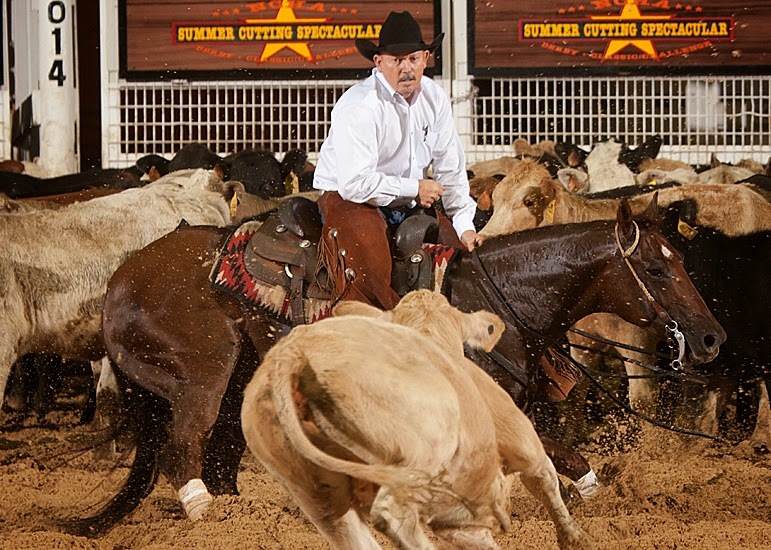 I have been busy getting Scott's horse prepared for the 1st and 2nd go rounds of the NCHA Summer Spectacular so I have been a little late on regular posting... I have a free moment so year I am! We were feeling like something light so a seafood joint close to out hotel on Hulen was a nice choice... Charleston's. 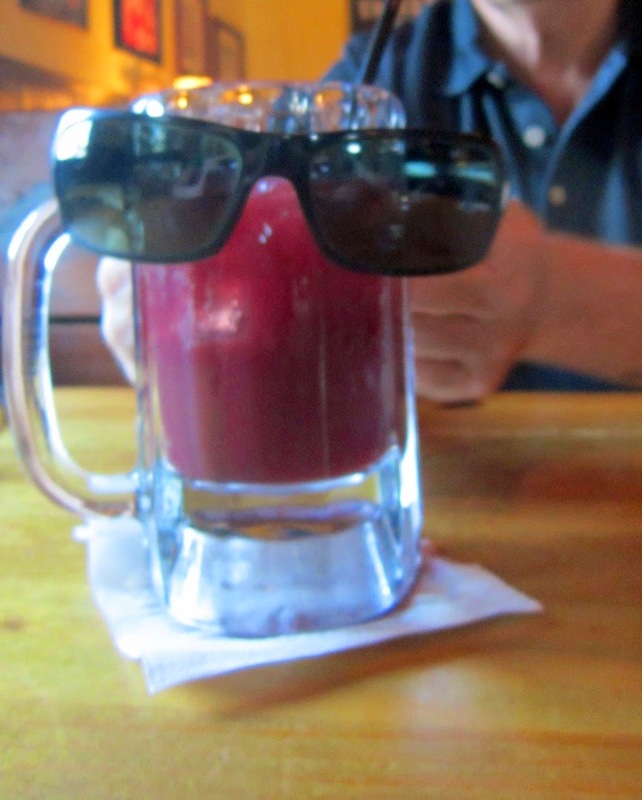 It has been roasty, toasty so Scott ordered a refreshing Sangria and let it borrow his shades to stay cool. I personally am not a fan of sangrias made with red wine, I prefer white with tons of fruit. It started off strong but as the ice cooled it down and melted it muddled the strong flavor. 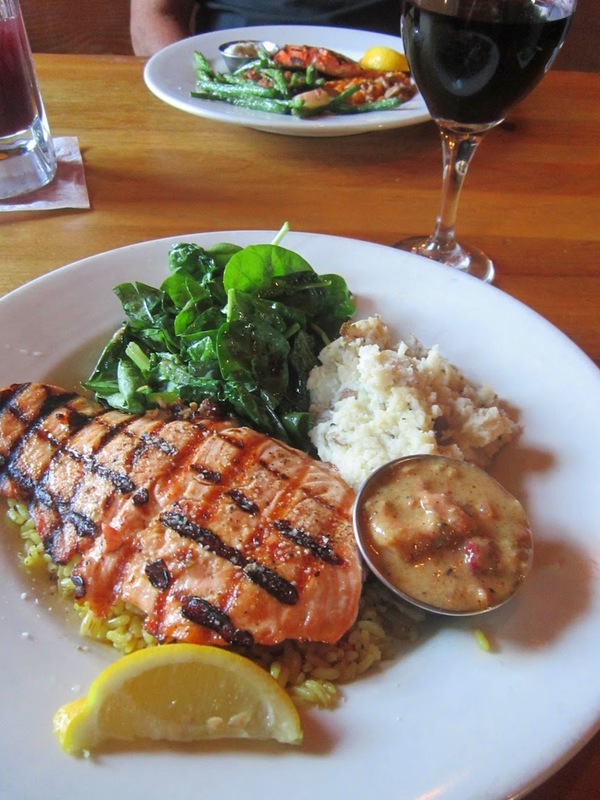 I knew exactly what I wanted: Salmon, Mashed Potatoes, and Sauteed Spinach. The wild Atlantic fish came on a bed of rice which I did not eat as well as a sauce I did not care for. The mixture of salmon, potato and spinach on each fork full is just like my heaven. Yum! Scott too went for Salmon and I was surprised he usually like white fish. His was Coho Salmon which is much more orange in color versus my choice. His plate was rounded out with asparagus and whipped sweet potatoes. What a bright plate! We shared a Blueberry Creme Brulee just because... It was ok, we polished it off so it must have not been too bad. 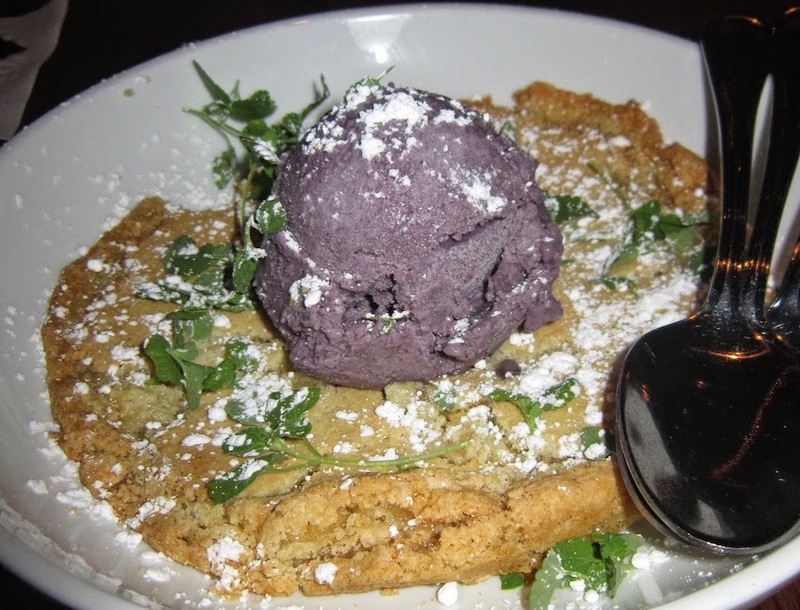 I liked he addition of blueberries I have not had that combination and think it is a keeper! 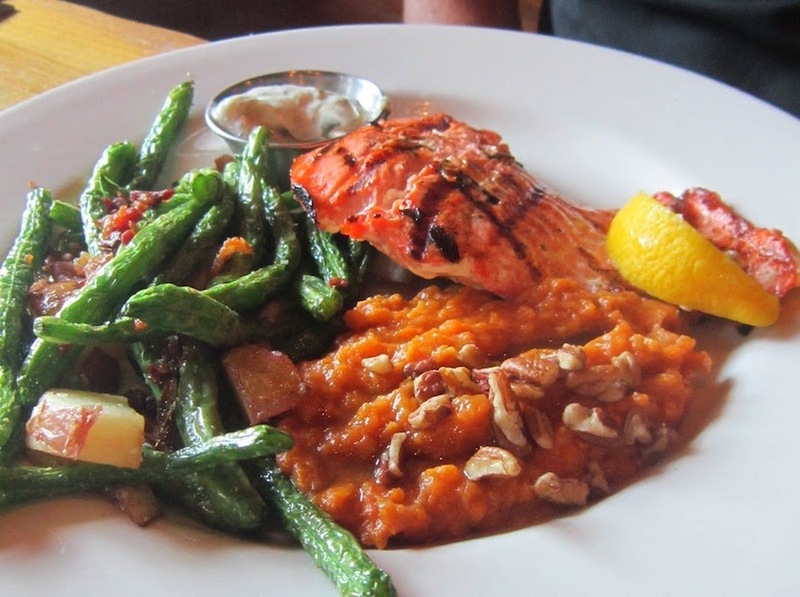 Charleston's is an excellent choice when you want a affordable, healthy meal. I like that they give you the option of choosing your protein, sides and vegetables. It makes you really happy when your dinner plate is set in front of you. I know I was! 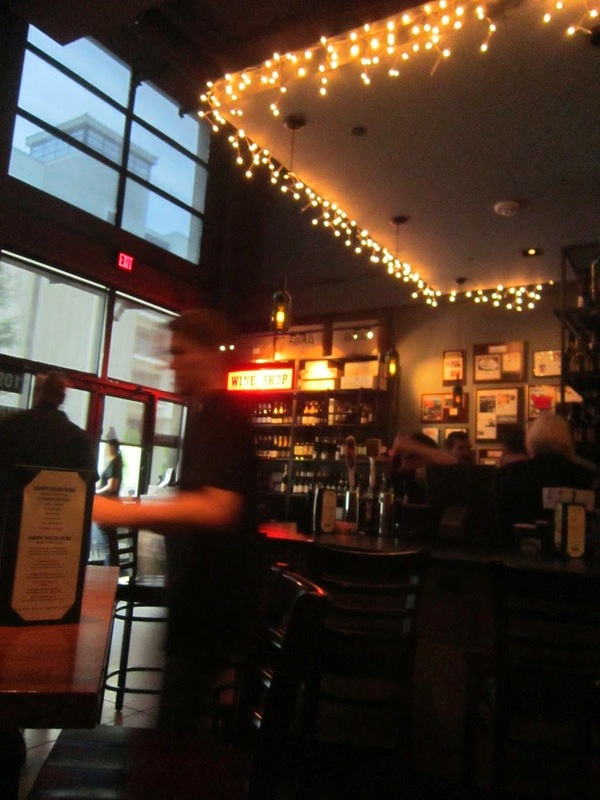 You know I am always looking for new restaurants to explore so when I discovered Max's Wine Dive on 7th Street in the Cultural District of Fort Worth I was very happy. 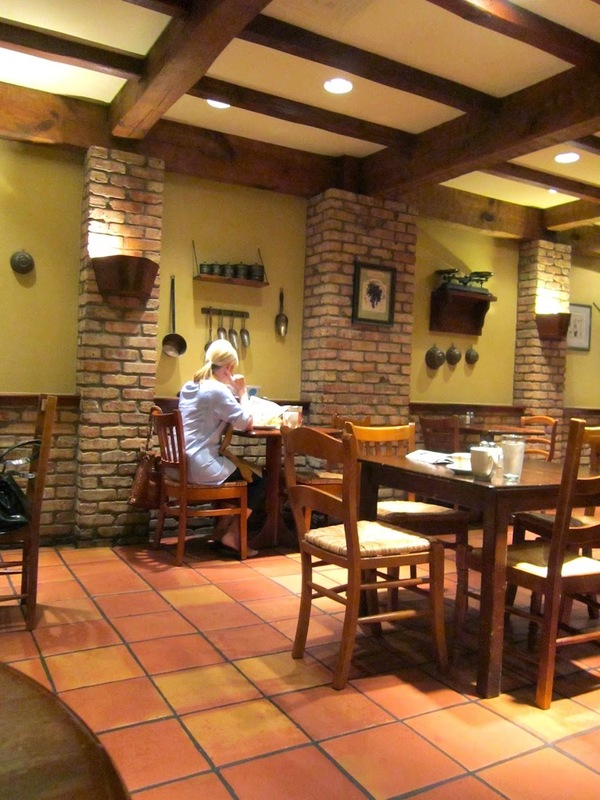 I had reservations and we were seated at a tall top in the very small dining space. It was buzzing with diners as the restaurant was quite full but I loved all the action. We were treated with Chicken Meatballs by the Chef. He was placing them down left and right to patrons. I love that! It is such a fun way to get excited about your upcoming meal. It tasted alot like Chicken Fried Steak and Gravy, which I think is fantastic! 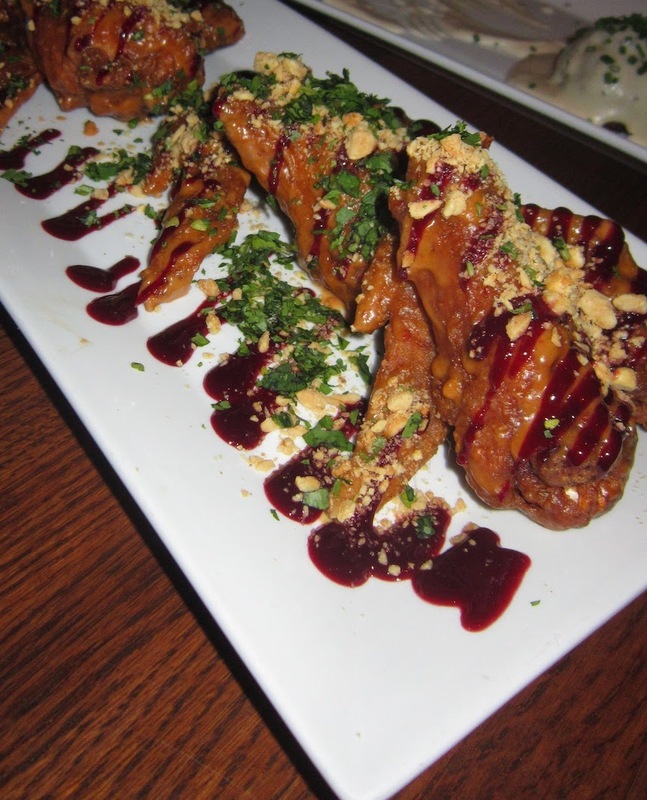 After placing our orders the Chef surprised us with another goodie, Peanut Butter and Jelly Wings! It was actually Thai Peanut Sauce and a Blackberry Coulis but it was so much fun I could hardly contain myself. The fried chicken was messy but I had a great time getting my hands (and face) dirty. Yum, yum! Scott went pretty simple for dinner and ordered a Grilled Cheese with Tomato Soup. It really is a classic order when done right and this was! 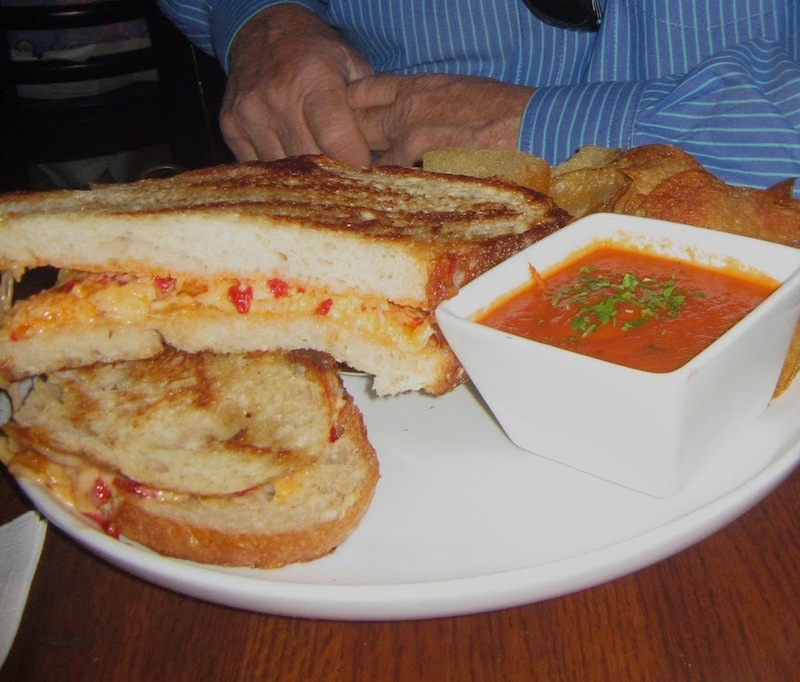 Guyere, provolne and a red pepper pimento cheese made this the perfect melt. I enjoyed the fried chips too, they were light and salty! Cowboy Ron went for the Fried Chicken Dinner and loved ever bite. The pieces of chicken were moist on the inside and crunchy on the outside. The greens and mashed were tasty but served a little cold to his liking. The problem could have simply been because he dug into the chicken first, the taters may have been afterthought and cooled during his chicken devouring. And now for my wonderful dish, Blackened Diver Scallops. 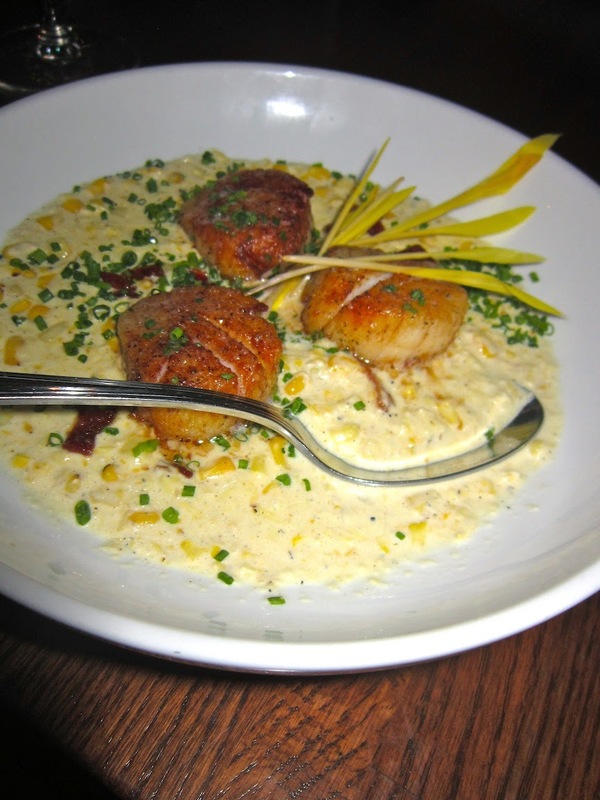 Three perfectly cooked scallops came afloat in jalapeno creamed corn complete with candied bacon and popcorn shoots. How delicious does that sound?! It tasted as good as expected and I recommend it to EVERYONE! Even to non-seafood lovers. It will make you a believer! Max's and Chef Stefon Rishel surpassed all my expectations with our dinner here in Fort Worth. I do a lot of research on restaurants and Max's showed up on the radar but I never visited it before now and I feel foolish for not dining sooner! 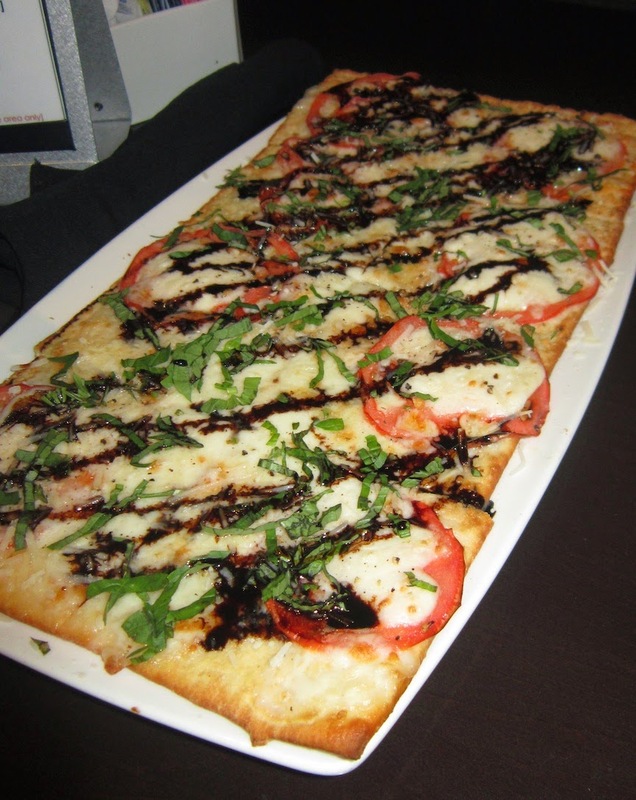 Make sure you make a reservation, order a bottle of Goldeneye Pinot and bring your favorite foodie friends. This place is fun! Scott and I arrived in Texas last week and were welcomed to rain! Rain and warm weather has made the countryside so green! The rain fooled us into seeking a comforting setting and what could be more so than a quaint French cafe? I am not going to lie Le Madeleine is a little confusing when you walk in. You have to place your order or choose to take from the food line right when you walk in the door. It makes for an awkward experience when you feel pressure to hurry up and order something as the hostess stares at you. 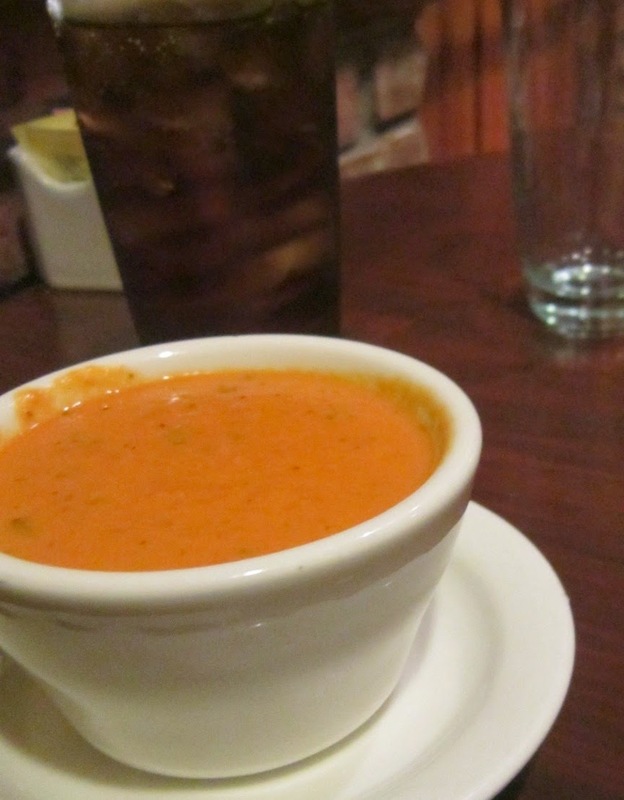 I felt the pressure and made my decision of Tomato Basil soup pretty quickly. All Scott wanted was coffee and breakfast. 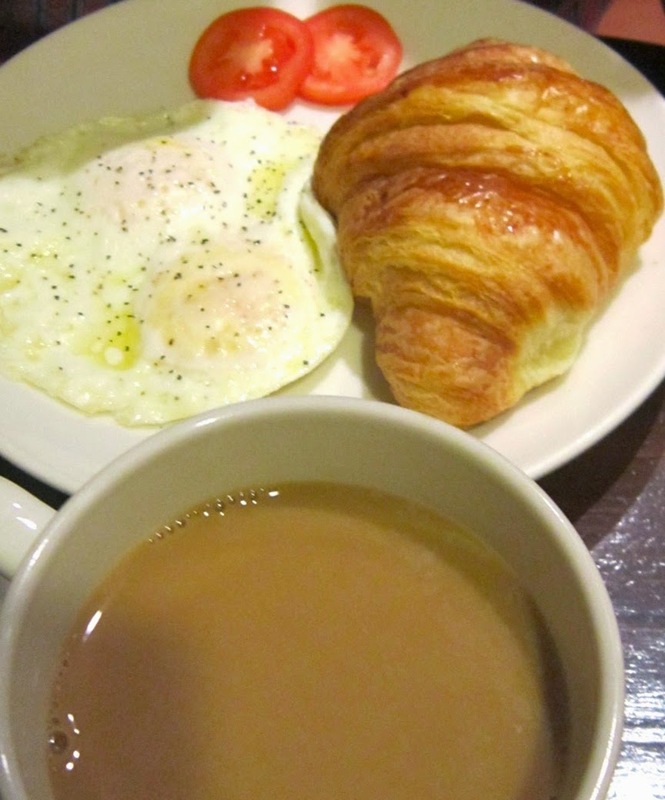 Eggs, tomatoes and a croissant is all he wanted. He made the hostess's life easy. I stared at her blanking a little too long for comfort deciding what I wanted with my soup. Surely a French Dip from a French cafe would be tasty right? Despite the greasy au jus, which did not offend me at all, it was a hell of a sandwich. My only complaint was that I only ordered a half! 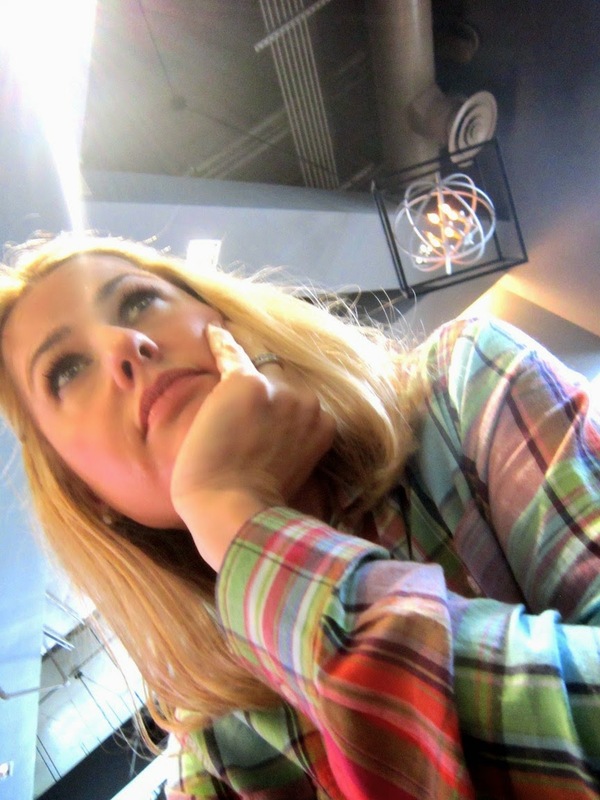 I could have really dug into another side of that sandwich! I noticed the bakery case on my way out and as I lie in bed typing this I am kicking myself for not getting a little somethin' somethin'. A lemon tart or a chocolate macaroon sound really good right now!